Enter through automatic wrought iron gates on Victoria Avenue. Press the intercom button and tell them you are attending Cambridge100’s Dinner (as there may be other dinners going on at the College). Drive straight ahead and turn right at the first junction and follow the road all the way around to the back of the College until you reach the car park. Walk through the main archway into the Second Court. Turn left briefly and follow the path up to the middle of the buildings facing you and go through the arch on your right. This bring you to the First Court. Half way along the buildings on your left is another archway. Go through this into to Cloister Court. Turn right until you come to the Prioress’s Room at the end. If drinks are being taken on one of the College’s lawns, ask at the Porter’s Lodge as to which lawn is being used (weather permitting!). Exiting: Cars – use the automatic gates that exit onto Jesus Lane (not Victoria Avenue). Access “The Chimney” through the gate on Jesus Lane which leads to the Porter’s Lodge. 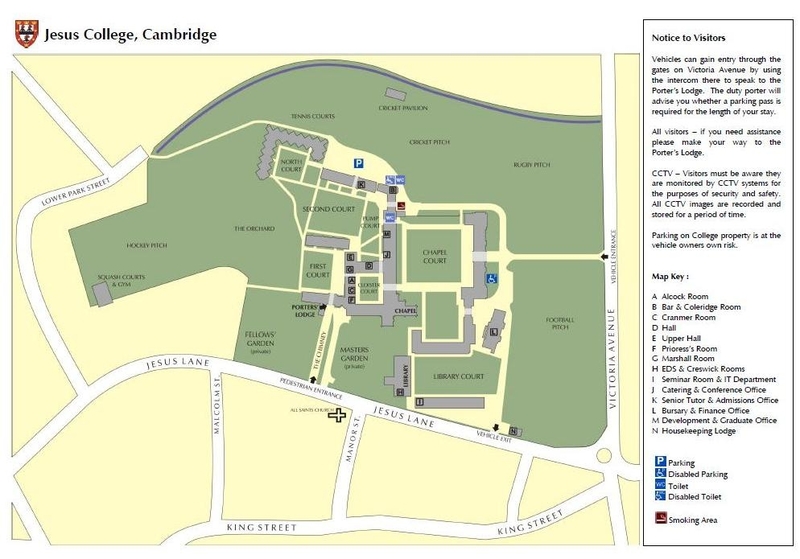 Tell them you are attending the Cambridge100’s Dinner and they will direct you.